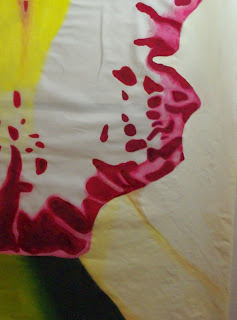 I am so pleased to see the finish line for my orchid pieces. Two of the 4 pieces are completely done and the last 2 I hope to have completely quilted in a day or two. 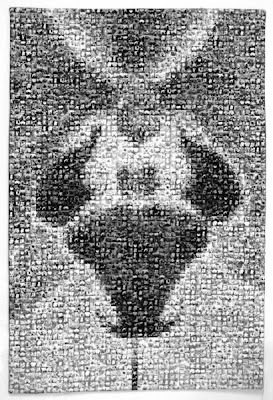 Recently, though, on the Quiltart list there was a discussion about whether a work of art needs to say something. I thought about that question as I was working on my orchid pieces and realized that for me it's a toss up. Sometimes I feel the need to say something with my work but most times I find I create artwork intrinsically from my soul. One of my pieces "Woman as Orchid" began life simply showcasing bursts of colour but took on more meaning as I worked on it. In the end it became a statement on how we as women - vibrant, sensual, simple yet complex individuals - try to hide a vital part of who we are. Our sensuality is sometimes suppressed by societal pressures and, for others, cannot easily be expressed. Orchids, like women, are vibrant and sensual but are so not afraid to show it. Their survival depends on it. The closer our exhibition gets the more excited I get and just can't wait to see all our pieces hanging together. It should be a wonderful show! If you are in the area, please make plans to come and see it. 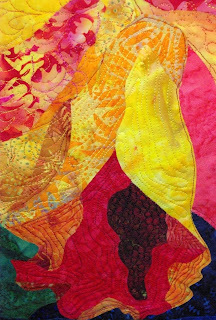 I'm on the homestretch of quilt #2 for the Sensuality Stitched show at the Daniel Stowe Botanical Garden. Yay! Tentatively titled "Orchid Squared: A Black and White Symphony," it's a companion piece to the first quilt "Orchids Squared: Purple Passion". I'm hoping they'll make an interesting contrast to one another. 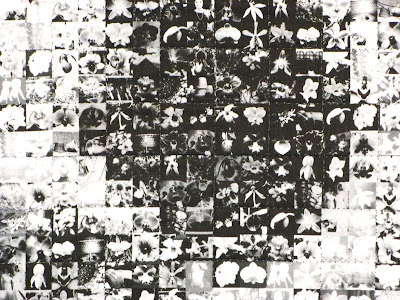 The "tiles" of the photomosaic, like those in "Purple Passion," are photos of orchids and orchid related images. 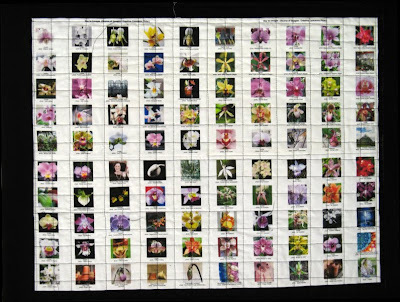 The photos are all identified on the back of the quilt, with credit given to the wonderful, generous photographers who are allowing their photos to be used in exchange for an acknowledgement. And while I'm thanking folks, I send my thanks to Grace Howes. I used her tutorial on "Facing Finishes" for these last two quilts. It's so much better than any other technique I've tried for quilts needing a nice, clean edge without a traditional binding. The finish, using Grace's technique is pretty much perfect...smooth, clean, polished. 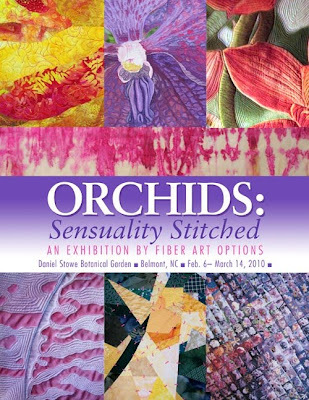 “Orchids: Sensuality Stitched“ is an exhibition of artwork by Fiber Art Options, a group of seven artists from the Charlotte area who work in fabric, paper and thread. The exhibition captures the exotic, colorful essence of the most diverse plant family on earth. Daniel Stowe Botanical Garden is hosting the exhibition’s first showing as part of its Orchid Spectacular. We will walk visitors through the exhibition, demonstrate our techniques and talk about our work on Feb. 6 and 7 from noon to 4 p.m.